I tried out 2 new Whole30 recipes this past Sunday during my meal prep and I'm so excited to share them with you! 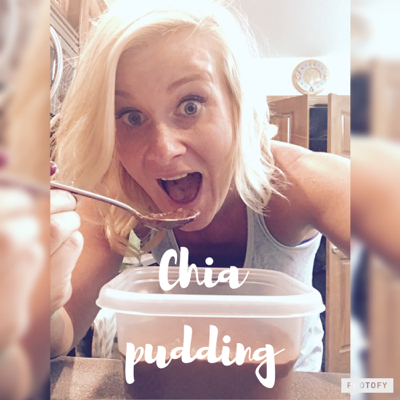 Bieler Broth and Chia Pudding! First up, Bieler Broth (not to be confused with Bieliber, lol). 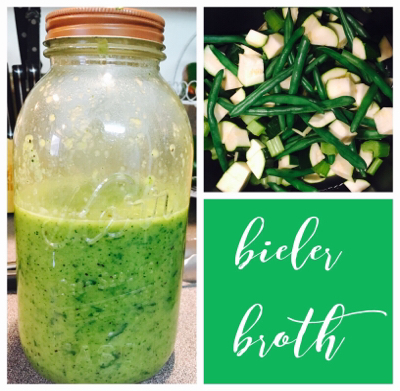 Bieler Broth is a gentle way to detox and is gentle on the tummy. It was created by Dr. Bieler, a physician who used it to heal a variety of illnesses. I made a big batch and put in a huge jar to have a cup each day at lunchtime (love it, because it's easy to take on the go since I'm in my car for work all day). Put the 1 cup of water and string beans in a stockpot and steam for about 5 minutes. Then put in the celery zucchini in the pot and steam for 5-7 minutes until tender, but still crisp. Put everything in the pot (including the water) in the blender and blend it up! Then add your ghee, parsley and salt & pepper. Pour into a big jar to enjoy it throughout the week (you could also freeze it as well in baggies). Next up, chia pudding! I've made this before, but didn't blend it up and the consistency kind of grossed me out (I'm all about consistency--like I really like diced tomatoes better than a whole tomato...I know, weird!). Chia seeds are a great source of protein and can help keep you feeling full longer. Place all the ingredients in the blender and blend it up (yay for easy!). I put in a Tupperware container and will have about a 1/2 cup serving for a dessert. It's super yummy! Hope you enjoy these! Let me know if you try them out!